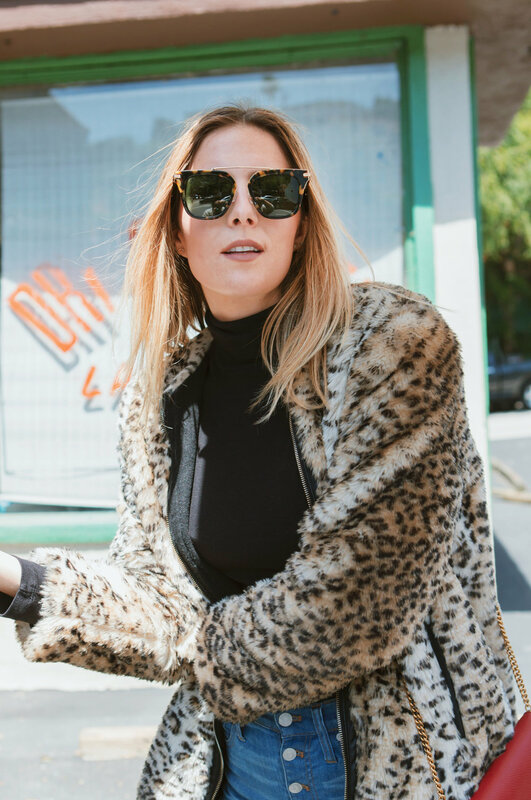 Tis the season for faux fur (and sunglasses if you're in LA!) and I am so happy about it! LA hasn't full blown seen the affects of fall yet but were getting there, and I'm ready with my statement coats and jackets. The photos below are from a shoot I did with Sonix, a super cool LA based brand that focuses on unique designs for everyday accessories with some major retro vibes! We were shooting their sunnies, which add some serious style and character to any outfit, which is why I love them so much. We shot in the middle of summer when LA was facing a heat wave, so don't be fooled by my look of pure joy like the weather was cool and crisp outside, it wasn't! Haha it was so hot and I was sweating through my faux, but hey, anything for the shot! See below for my roundup of my current favorite statement jackets from $34.95 and up, and check out these sunnies in my "shop the post" section! Do you guys love these coats or what? I am so excited for the Holidays coming up and can't wait to sport more of my favorite Fall and Winter wear! Hope you all have a great rest of the week and let me know which statement jacket is your fave! Also, if you love the sunnies I'm wearing, you can shop them below!